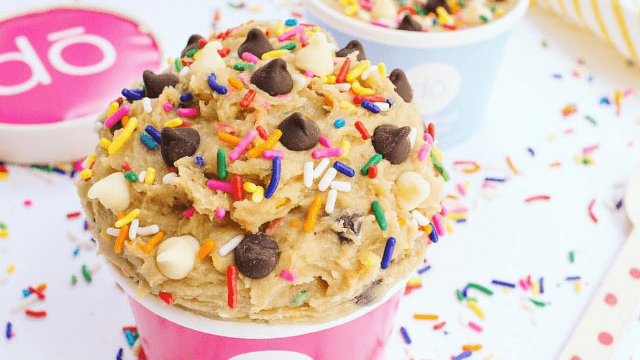 A raw cookie dough restaurant just opened in NYC and everything is fine now. Democrat or Republican, surely this divided nation can agree on one thing: the true low point of 2016 was when the FDA issued an ominous warning that eating raw cookie dough might kill you. The warning wasn’t even echoing your dad’s tired lecture about salmonella in raw eggs; it was sparked by a brand new scary thing: an e. Coli outbreak in flour. Suddenly, cookies had to be cooked. Gooey spoons languished in the sink. Cookie dough bowls went unlicked. It was a dark time for everyone. Until this week, when raw cookie dough made a dramatic comeback in the form of DŌ, a “cookie dough scoop shop” that just opened in Greenwich Village, NYC. According to their website, DŌ basically functions like an ice cream shop. You choose your flavors from options that range from classic chocolate chip to fluffernutter and brownie batter, get scoops in a cup or a cone, and are encouraged to sample as much as you want. The store also serves other decadent treats, including cookie dough ice cream pie and a layered, buttercream-coated contraption called a “cookie bomb." Is it really safe to eat raw cookie dough? Technically yes, because DŌ uses pasteurized egg product and heat-treated flour. Not sure what the FDA would have to say about eating multiple cookie bombs in one sitting, though.